Berbice was the oldest of the three Dutch colonies, with Fort Nassau, far inland on the Berbice River, established around 1627. 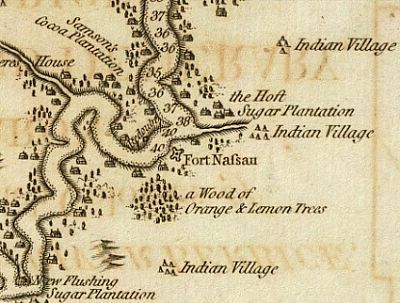 Below: detail from Part of Chart of the Guiana Coast by Edward Thompson, 1783 [David Rumsey Map Collection] with Fort Nassau underlined. Berbice received a new constitution in 1732 and there was then a period of growth. In 1763, the year of the Berbice slave rising, there were 88 plantations on the Berbice and 27 on the Canje. After the slave rising, however, the colony’s white population fell from 286 to 116, and the number of slaves from 4251 to 2464. 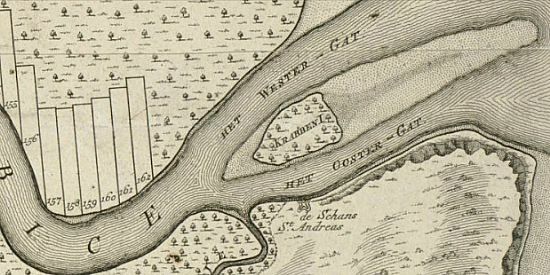 A map of 1771 shows that the number of plantations has increased to 162 on the River Berbice and 87 on the Canje [Johannes van Keulen, Nieuwe ez zeer accuraate generaale caart van de twee rievieren Berbice en Canja, 1780 - the correct date of the map is 1771, see VEL Archive]. 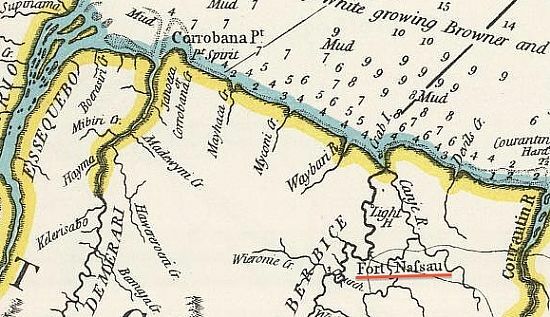 By this date Fort San Andreas has been built at the entrance to the Berbice River. 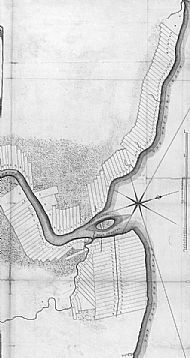 However, many of these plantations may have been unoccupied as a result of the slave rising of 1763 and the epidemics of the early 1760s, which particularly affected white setlers. Detail from van Keulen, Nieuwe ez zeer accuraate generaale caart van de twee rievieren Berbice en Canja, [Boston Public Library]. The town of New Amsterdam, at the mouth of the Canje opposite Fort St Andreas, was created between 1785 and 1790. From 1791 new grants of land on the sea coast were made by the governor, van Batenburg, mainly for the cultivation of cotton [Netscher, ch 10]. In 1799 the neighbouring colony of Surinam surrendered to British forces. The boundary between Berbice and Surinam has, until this date, been Devil's Creek but this was adjusted so that the coast as far as the Courentyne River became part of Berbice.